Gov. 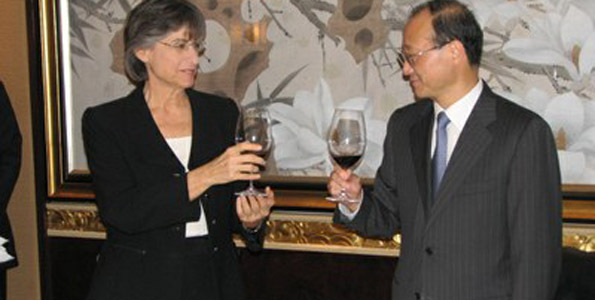 Linda Lingle continued to build important economic and cultural relationships with high-ranking U.S. and Chinese officials at a series of meetings in Beijing, China. The governor traveled to Beijing after meeting with officials in Yunnan Province on Friday, June 11 and Saturday, June 12. Known as the beginning of the famous Silk Road, the Province’s capital city of Kunming is an important trade center in Southeast Asia. The city is also considered to be the home of the fabled Shangri La, and is the location of the Burma Road used to bring in supplies to U.S. troops during WWII. Lingle was the guest of Vice Governor Gu Zhaoxi of the People’s Government of Yunnan Province at a State dinner attended by members of the Yunnan Province Cabinet in Kunming. Prior to the dinner, Lingle and Gu had the opportunity to discuss the similarities between Hawaii and Yunnan, and the opportunities available for educational and business exchanges. Also in Beijing, the governor had a private meeting with Ambassador Jon Huntsman at the U.S. Embassy. During this hour and a half discussion, the Ambassador and Governor discussed the importance of establishing a protocol for the processing of visas for Chinese who want to visit Hawaii on charter flights going directly from cities such as Shanghai and Beijing to Honolulu. The governor and ambassador also discussed the relationships between China and the United States and the role Hawaii can play in continuing to enhance those relationships. Members of the Hawaii delegation, including deputy director Duane Okamoto of the Department of Agriculture, were able to engage in direct talks on clean energy and agriculture with senior embassy officials including Martin Schoenbaur, executive director of the U.S. Department of Energy, William Zarit, minister-counselor for commercial affairs, and Gwen Lyle, the commercial officer of the Embassy who focuses on tourism development. The embassy staff was interested in the upcoming Asian Pacific Clean Energy Summit and the opportunities this event will provide for Chinese firms interested in learning from and investing in clean energy projects in Hawaii. There was also an important discussion on the role of biofuels for military applications and the R&D work the State Department of Agriculture is undertaking to focus on plants and algae strains with the most promising prospects for bio-fuels development. In the evening the governor had the honor of being hosted by Chairman Shao Qi Wei, the head of the China National Tourism Association. Shao, his senior staff, and the Hawaii delegation had a wide-ranging discussion on the role tourism can play in providing not only leisure activities for visitors, but also serving as an educational venue that can focus on the shared history of China and the United States. Shao shared with the Hawaii delegation examples of the roles Chinese and American troops played in World War II and the critical battles fought in China that helped the Allied Forces win the war of the Pacific. The governor and chairman also compared and contrasted the way in which the United States government carries out tourism-related functions and the manner in which the Chinese government focuses on tourism programs on a national level, in coordination with tourism offices in its 31 provinces. Shao gave a few gifts to the governor, including the internationally recognized figure for the 2010 World Expo.